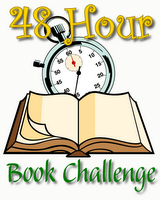 Good Luck to the 48 Hour Book Challenge Participants! Sorry folks, but for the first time in 3 years, I won’t be doing the 48 Hour Book Challenge. It is a really busy weekend for me and thinking about squeezing the challenge into my schedule makes me feel stressed rather than happy. This weekend is the annual city wide garage sales for our town and I have already been shopping it up over here. I plan to go out way early tomorrow and hit the good sales. One of the sales at the library has GIRL SCOUT COOKIES!!! The last two years I have rushed through the sales like a crazy person to get back and read, but tomorrow I am going to take my time and browse to my heart’s content. Then I have a teen program at night and a meeting on Sunday (ugh). So I am not going to have a lot of time to read. Not only will I be pressed for time, but I am also well on my way to my summer zombie-fied state. I read like a freakin’ maniac during the rest of the year, but in the summer I literally stop functioning outside of work. Last night was our summer reading kick off and there were like 400 people there. After something like that I just want to sit on my couch and stare at the wall for days, because my brain literally can’t handle a book. I will try to keep up my reading this summer, but my amount of books read is going to decrease dramatically from now until August. So, I have rambled on for way to long, just to say that I’m not doing the challenge this year. So good luck to everyone who is already reading away (go Abby!) and I hope you all reach your reading goals! 1) I’m catsitting this weekend. Normally, this wouldn’t really affect anything because reading and petting a cat at the same time is pretty nice, but there’s half an hour between my apartment and my friend’s and because of reason #2, I’m not staying there. This means a lot of time in the car, and I didn’t get any audiobooks from my library. 2) Family unexpectedly came Friday night. I had some family come into town Friday night and needed somewhere to stay. Unfortunately my apartment needed cleaned but I didn’t have time until Friday after work. So Friday night was a whirlwind and my reading wouldn’t start until Saturday morning. Still do-able, I know. But let’s move on to #3. 3) I’M MENTALLY EXHAUSTED. Work has been so exhausting this week. I feel like my brain doesn’t shut off anymore. Our Summer Library Challenge starts this Monday. That probably explains enough for all your librarian friends in the blogworld. We’ve been tying up loose ends involving prizes, and I’ve been spending A LOT of time this week on stuff for the summer teen volunteers. Let me just say this: Figuring out a schedule for approx. 50 teens to volunteer every hour the library’s open is kind of difficult. Throw in actually creating the schedule, letting the teens know, telling staff things they need to know, preparing time cards, etc. etc., I’m tired. Oh, and I worked yesterday for several hours. 4) I read a lot last week and am a little burnt out. Last weekend, I unfortunately did not have any plans, which I’ve concluded is just sad for a 3-day holiday weekend, so I read A LOT. I finished The Line by Teri Hall (great! ), Dark Life by Kat Falls (great! ), and Cross My Heart and Hope to Spy by Ally Carter (also great!) and got through about half of The Devil in the White City by Erik Larson (so far, great! 🙂 ). Last year, all of us NerdGirls did MotherReader’s 48 Hour Book Challenge. I am not sure if my fellow girls are going to do it this year, but I will not be (officially) participating. I just wanted to do a quick post explaining why I won’t be doing it. The first reason is that every weekend for me is like a 48 hour book challenge. When the weekend rolls around, I hole up in my apartment and read for literally at least 20 hours. It is wonderful! I have already read 341 books since January (sadly, that is not an exaggeration). So the “challenge” aspect of it wouldn’t really be anything new for me. The only way it would be different would be if I was one of those people who didn’t shower, sleep, or eat during the 48 hours, which I refuse to do. So, I will gladly be reading right along with all of my friends in bloggerworld, I just won’t be an official participant. I might post something at the end of the weekend with my rough hours and the books I read, but that is only if I am lucky and get a signal when I need it. So, to everyone participating this weekend, I wish you luck!!!! I look forward to hearing all about what you read over the weekend. Even though my time isn’t technically up until 6:30 tonight, I am definitely done. This challenge has wiped me out. Since I am very excited to get back to my normal life of watching tv and being an all around lazy fool (and lounging around in my brand new air conditioning) this will be brief. 9:41-10:57 Finally finished The Lincolns!! Huzzah!!! When I read the quote on the 2nd to last page about Mary Lincoln (something about a crazy woman lurks inside) I couldn’t help but think of the story Candace Fleming told that went along with it. The story was perfect and touching and too long to go into here, but it was one of the things that made me love her (both Mary Lincoln and Candace Fleming). Ugh. So glad to be done with these books (I am NOT reading Extras). This quote pretty much sums up how I felt about the main character Tally: “This was the final price of her massive ego.” Yep, that was my entire opinion of her, just one big massive ego. I also didn’t like how everyone thought she was so awesome because she could think for herself and she changed her own mind. But really, when you think about it, she only ever changed because of the BOYS around her. She never thought for herself, she needed help from the guys in the story to help her realize what she needed to do. It was pretty much the opposite of the classic beauty and the beast story. She changes for the better because of the men around her. Great message. Also, I was really pissed off at the ending. I would have been much happier if Tally would have wasted away in that tiny cell for the rest of her hundred years. Yeah, that’s right, I can be cruel to fictional characters. This was a rather broken up reading experience first because I ate lunch in between and also because my landlord came over to install my window air conditioner. He’s a very nice guy but not a great landlord. He hasn’t cashed any of my rent checks and he totally knocked over and chipped one of my pitchers while trying to install the air conditioner. Thank God that’s over. Anyway, I loved this book!!! The beginning was very slow and I almost stopped about 13 pages in, but then they got to the island and things took off. I don’t usually like horror movies, but reading this book felt like watching one. It was super suspenseful and I had no idea what was going on. Very very good. I have wanted to read all of Sarah Vowell’s stuff ever since I saw her extra feature on The Incredibles DVD (she played the voice of the daughter Violet). She comes across as a little crazy in the book, but crazy in a good way. It is all about how she travels to different places that deal with the assassinations of Presidents Lincoln, Garfield, and McKinley. It is hilarious and informative and all around awesome. I’m not done with it yet, but I’ll hopefully finish it soon. I also have two of her other books checked out too so I am looking forward to those as well. Total hours: 20 hours 12 minutes!!!! Yea!!! I think all my math is correct, I can’t vouch for it right now because I am a little loopy, but now I am going to go eat a Buster Bar from Dairy Queen and lots of potato chips. A lot of things got in the way of my reading today, but hopefully I am not completely done yet. This morning I went to lots of garage sales in the rain (yea for a new pretty cat carrier!) and then got a new driver’s lisence (yea for looking like a drowned rat in my picture!!). There was also a lot of other unnecessary running around in the rain as well (Amber, I bought some of that Be Curly stuff!!). Unfortunately as the morning wore on I started to feel very icky. Yesterday I had a really bad sore throat that I attributed to one too many classroom speils about the summer reading program. Well last night it was really terrible and today I started to get the all-around-exhausted-icky-malaise feeling that comes with actually being sick. This is not good. Anyway, to quit rambling, here is what I accomplished today. This morning while I was out and about and then tonight while I ate dinner I listened to the inbetweeny Percy Jackson book of short stories. I found it relatively amusing and I always like to see what my favorite characters are up to. I don’t think I got the whole experience by listening to the audiobook because I think there are portraits of the characters in the actual book, so I am sad that I missed those. Thank the Gods for being able to listen to an audiobook to break things up! This book was okay. It didn’t really have much substance and the characters didn’t really resonate with me but I am so glad that I read it because I adore the name Nesta!!! And anything British-y is fine by me. 2:19-4:46 Had to take a nap…..darn sickness catching up with me. I liked this book a lot! It is right up my alley. I totally have a weakness for fairy tale/princess stories. I loved that it was told from the guy’s point of view. Now I need to get my hands on the 2nd one. Still liking this book a lot. One thing that really hit me was that I would not have wanted the Lincoln family to visit my library. Apparently Mary and Abraham let their kids do whatever the heck they wanted and they totally would have gotten a mean librarian glare from me. Then I was interrupted by my mom calling, which was a nice break and now I am blogging again. I think I will keep reading a little while longer, but I don’t know how much longer I can go tonight. I don’t plan on waking up real early in the morning, but I know I can make my goal of 15 hours. 7 hours 13 minutes counted today (including blogging and audiobook) so far and with the 6 hours from yesterday that makes 13 hours 13 minutes……….oooooohhhhhh, unlucky way to end the day…..must read some more! P.S. I know I said I would read Specials today, but it just didn’t happen, we will see about tomorrow. Ok, I know I’m starting way late, but I was hanging out with family yesterday and this morning. I’m starting as of noon on Saturday, but technically I had to start as of 7 AM. So I’m already a little behind. I think my goal is to read 12 hours. If I do more than that, it’ll be great, but I figured for my first 48hbc, I should just try for the average. I think it will be challenging enough. I have a stack of books to read that I borrowed from my older sister. I’ve had them since January. Oops. And later today I’ll have a stack more of library books that my sister is loaning me because the library at home is way small and doesn’t have anything new — or everything’s checked out. I’m in the middle of Specials right now, so I think I’ll go ahead and finish it before starting something else. That should still count, right? It’s reading. Ok, time to read. More later!